Developer : FREESTYLE GAMES S.L. Skater girl, start skating now and prove to the boys that you are as good as them... or even better! Prove now your skateboard skills and enjoy playing different freestyle movements and tricks to become a better skater girl! Join us in this freestyle competition between boys and girls! 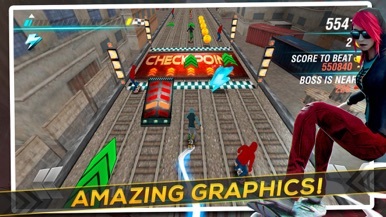 - Train to skate faster and further in this exciting skateboard game on an infinite race full of enemy skaters! 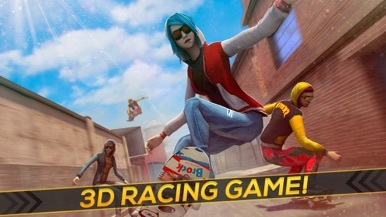 - Feel the real speed with intuitive mobile control for all skill levels: You just need to tap on the screen to accelerate or slow down your skater girl! Can you make a delicious burger for lunch? Have fun playing this awesome Cooking Food Maker game! Sooo many Cooking Levels & Game Modes: - Make Gummy Bears and serve them! - Test your cooking skills and make Pancakes - Cook some Japanese Curry for everyone! Start cooking and have lots of fun! Tap to jump over obstacles and collect the gems to earn points. More by FREESTYLE GAMES S.L.